Raising youth in our technologically advanced society is a challenge for most caregivers technologywho struggle to understand the effects and how to set limits on their children’s screen time. Today’s youth are the first to be raised in the age of the smartphone, and its influence can be felt everywhere. Smartphones, video games, and digital media have created new headaches for many families. Concepts like sexting, online bullying, video game addiction, and obsessive social media attachment have become common practice among today’s youth. Behaviors as these can often lead to disruptions in school and sleep, anti-social behavior, and depression. For parents and caregivers, the question of how to even begin addressing these concepts with their children seems like a daunting task. 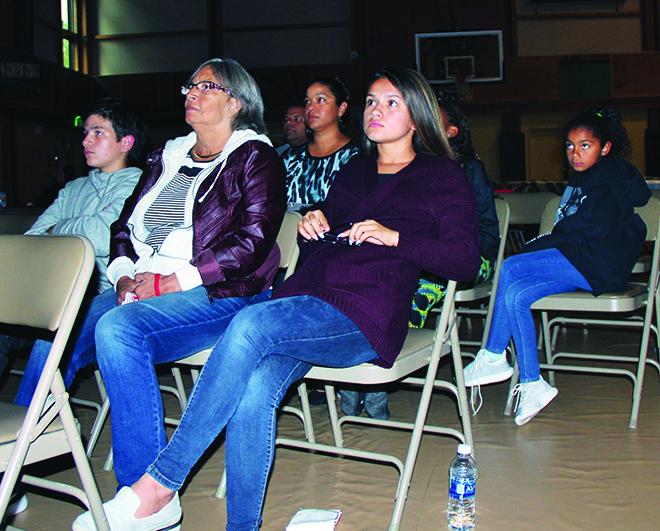 In this context, Tulalip Youth Services invited youth and their parents to participate in a discussion of the topic and view the award-winning film, Screenagers: Growing Up in The Digital Age, on the evening of September 19. Screenagers is the first feature documentary to explore the impact of screen technology on kids and to offer parents proven solutions that work. During the film’s screening there were 32 youth in attendance, plus several caregivers and Youth Services staff members. 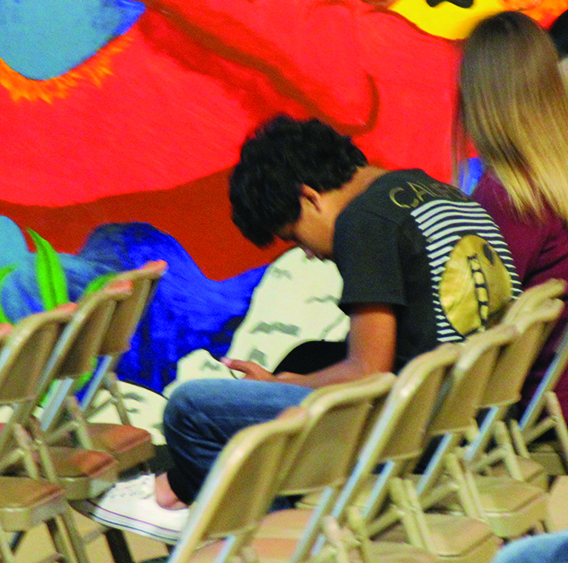 Screenagers provided an in-depth, personal look at how families are coping with kids and screen time, the plot explored how being connected to devices is affecting relationships and even child development. Directed by Dalaney Ruston, a Seattle filmmaker and physician, the movie profiles her own family’s struggles with smart phones, social media, and video games. The film includes interviews with parents, teenagers, authors, psychologists and neuroscientists providing ideas on how we can empower ourselves to best navigate this digital world we live in. Throughout the film, children and their parents are shown dealing with often serious consequences related to excessive screen time, or screen time without boundaries. Revealing stories that depict messy struggles over social media, video games, academics and internet addiction are shared. A boy who lives with his grandmother becomes a “different child” when told he has to get off his video games. The grandmother seeks help for dealing with the confrontations. Another boy, Andrew, is so consumed with playing video games into the wee hours during his freshman year of college that he stops going to classes and leaves school. He enters a rehabilitation facility to treat his addiction. Another girl, Hannah, shares a picture of herself in her bra with a boy she likes. When he shares the picture, the girl deals with the fallout at school and being bullied. It’s not just the kids scrolling Facebook or Instagram or blasting away on the PlayStation that demand the attention of the filmmakers. Adults connected to work and their own social outlets through devices are called out by the very kids who they are attempting to digitally police. “Can we really tell our kids, ‘Do as we say and not as we do’?” the film asks. Interwoven into these stories, are cutting edge science and insights from thought leaders who present evidence on the real changes happening in the brain. For example, we are led to believe that through technology we can multitask. However, the truth is our brains aren’t built to multitask. We’re meant to focus on one thing at a time. Switching what’s on our screen from Facebook to Instagram to Twitter and inevitably back to Facebook , that back-and-forth raises levels of the hormone cortisol in our brains. Cortisol is the hormone produced when we are stressed. On top of that, every time you refresh any of your social media feeds, the brief burst of news or images gives you a quick dopamine hit, which activates the brain’s pleasure centers and leaves you wanting more. It’s a destructive cycle that can lead to addiction and an inability to stay unplugged and offline. While our digital lifestyle is certainly not going anywhere, it’s critical to find a healthy balance between screen time and real-world interactions. In most cases, this means putting realistic restrictions on screen time for children and their parents. Among community viewers at the film screening was tribal member Nickie Richwine and her three daughters. Following the movie, Nickie shared she already places restrictions on when and how her daughters can use their devices, but has learned additional methods of staying offline from the film. Screenagers: Growing Up in the Digital Age probes into the vulnerable corners of family life, and delves into the messy family conflicts over social media, video games, academics and internet addiction. Only through self-reflection and an open dialogue do solutions emerge on how we can best empower young people to navigate the digital world. More information can be found at screenagersmovie.com. Dr. Ruston suggests putting phones and other devices away at meal times, in the car and during family outings. While studying, teenagers should put their phones in another room but can take “tech breaks”. No phones, tablets or other devices in the bedroom when it’s time to sleep. Rather than relying on your phone, buy an alarm clock and a calculator. Limit interactive video games to certain times – the weekend, for example – especially for younger children. Try what a group of teenagers do in the film: when they eat out, they put their phones in the middle of the table. First to check their phone pays for dinner. Set aside regular time to calmly discuss any issues about mobile phones and other devices rather than letting them spark arguments. Parents worried about their children’s screen usage should think about what they are doing themselves. 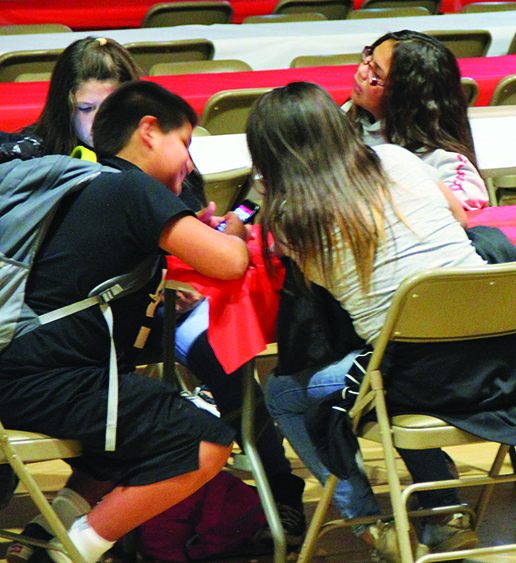 This entry was posted in Education, News, Top Story, Tulalip News and tagged Screenagers, Tulalip Tribes, youth by Kim Kalliber. Bookmark the permalink.